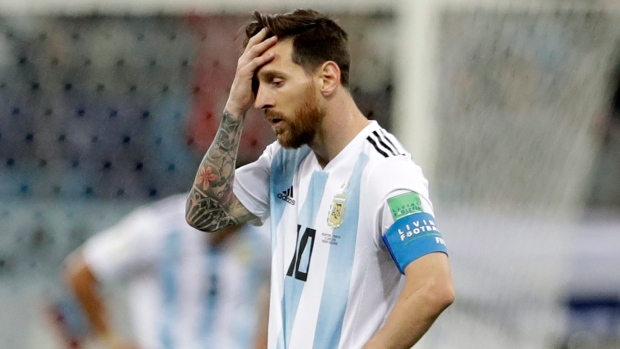 MOSCOW — Lionel Messi, arguably the greatest soccer player in history, has had a miserable World Cup and must turn it around immediately to save Argentina from a humiliating early exit from the tournament. Messi leads Argentina into a must-win Tuesday game against Nigeria at St. Petersburg Stadium, where the African team would advance out of Group D with a victory. The South Americans are winless at the World Cup, Messi has yet to score a goal, and a victory against Nigeria won't guarantee a spot in the round of 16. Argentina must win, and get help from Croatia, which has already advanced. Croatia has no pressure in its match against Iceland, which must win its final Group D game in Rostov-on-Don to advance. If Iceland wins, Argentina is out and Messi's international career might be over. Messi turned 31 two days before the match, and there's strong speculation he'll retire from the national team if Argentina loses. "That will be our main goal, to make it Messi's last World Cup game," Nigeria defender Bryan Idowu said. "As much as we enjoy watching Messi play, it's against us. There's only one option for us, (which) is that he plays his last game in St. Petersburg." Argentina fans have been livid over the performances of the national team in this tournament, with much of the wrath directed at Messi. Although Nigeria coach Gernot Rohr is a fan of the five-time world player of the year, he has no sympathy for Messi's plight Tuesday. "Everybody loves him," Rohr said. "But in football there is no mercy, there is no pity. Everyone wants to win and no one can make any gifts, even if we like him so much." Messi, whose 64 career goals for Argentina, missed a penalty in Argentina's opening match, a 1-1 draw with Iceland. He also failed to score in a 3-0 loss to Croatia. It's part of a disappointing international run in which Messi's only medal with Argentina came 10 years ago at the Summer Olympics. He didn't score in the 1-0 loss to Germany in the World Cup final four years ago, and was on the losing team in the Copa America finals in 2007, 2015 and 2016. The match will be the fifth meeting between Argentina and Nigeria at the World Cup, and Argentina has won the last four. Messi scored twice when Argentina beat Nigeria 3-2 in the group stage four years ago. Iceland, meanwhile, is the nation with the smallest population ever to qualify for a World Cup with 350,000 inhabitants. The entire nation has been following the squad, which is known at home as "Our Boys." The draw against Argentina was an upset, but Iceland then dropped the next game 2-0 to Nigeria. Iceland beat Croatia in a World Cup qualifier, and now finds its rival in its path again. "We know the scenario when we play Croatia, it's going to be a really tough game," coach Heimir Hallgrimsson said. "We've often said we're like a married couple. We're trying to get divorced, but we always meet up again." Both games are at 9 p.m. (2 p.m. EDT, 1800 GMT). France has already advanced and needs only a draw to win Group C. Denmark can move into the round of 16 by earning one point, or if Australia loses to Peru in a game played at the same time. There's tension before the game being played at Luzhniki Stadium in Moscow. Denmark coach Age Hareide criticized France before the World Cup when he told a Danish newspaper the squad was "nothing special." He even suggested Paul Pogba was too focused on his hairstyles. That irked the French team, and coach Didier Deschamps said the comments were "not something particularly pleasant." "My players can read, they can listen," Deschamps said. "They know, they recall very well what the coach said." Denmark is trying to advance from the group stage for the fourth time in its fifth World Cup appearance, but is without two critical players. Yussuf Poulsen, who scored in a 1-0 opening win over Peru, is suspended for yellow cards. Midfielder William Kvist is back in Russia but had returned home briefly for treatment on cracked ribs and a punctured lung in the game against Peru. "It's now only the fractures on the ribs that give him problems," Hareide said. "So we have to see if he's fit to train after the match against France." Australia used a 1-1 draw against Denmark to remain in contention for a spot in the round of 16, and Peru has already been eliminated. Australia needs to win and could use 38-year-old striker Tim Cahill, who has yet to play in Russia, because even with a victory over Peru the squad needs goals. An Australia victory, coupled with a France win over Denmark, would lead to goal difference determining which team advances with France. If Cahill gets into the match and scores, he'd be the fifth player to score in four World Cups — joining Pele, Uwe Seeler, Miroslav Klose and Cristiano Ronaldo. Australia has struggled to score in the World Cup and its last three goals in the tournament have come from penalty kicks, including two from captain Mile Jedinak in Russia. Australia is only the second team in World Cup history to score three consecutive goals from the penalty spot. Ghana did it from 2006-2010. Peru will likely be without striker Jefferson Farfan, who was hospitalized with a head injury from a hard collision with a teammate during training over the weekend. This match will be the first between Australia and Peru.